Source: I received a copy to review. The opinions expressed are my own. Owen Sage is the emblematic college freshman at Easton Falls University. With all the worries about his first year in college, he was not prepared for what would happen next. His way of life was flipped upside down when he mysteriously crossed into another dimension, into the beautiful land of Everville. 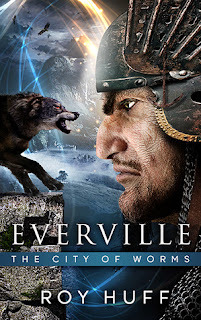 His excitement was abruptly halted when he discovered that there was a darkness forged against both the natural world, which he knew well, and the new land which he discovered, Everville. He must devise a plan to save both worlds while joining forces with the race of Fron and The Keepers, whom both harbor hidden secrets he must learn in order to gain power over the evil that dwells in The Other In Between. With a race against time to save both worlds, his short time at Easton Falls did to quite prepare him for the evil, dark forces he must fight in order to conquer The Other In Between. One thing I loved about this book was that the action was instant and constant. The author has created characters that you want to care about. You are led to feel as if they are your best friends. The world is one that I would like to visit because of its characters. This author is a master at description. It is a talented person that can create two worlds, a normal real world for a character and an alternate world where the character(s) travel back and forth. You would think that this would be confusing but it is not. The author has taken an ordinary, or so we think, college student and turned him into someone who will battle evil for the good of all no matter what the cost. This is the first book in the series and a must read, followed by the second book in the series. 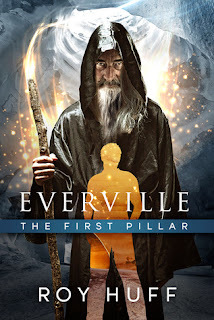 College freshman Owen Sage has just started to understand the darkness trying to overtake Everville and the earthly realm. With the help of The Keeper and the Fron army, Owen has managed to buy some time, but new problems have already emerged, new secrets need to be revealed, and the race against time to stop Them form conquering both dimensions has only just begun. The Keeper, Owen Sage, and his friends at Easton Falls University must now battle threats from within. To do it, they must reunite with familiar creatures and join forces with new ones as they navigate their journey to the truth that awaits them in Everville. I loved visiting with these characters again. The author held true to the first story creating new characters that within the world of fantasy are very believable. One of my students told me the other day that she liked reading books that was more like turning a movie on in her brain. I know exactly what she was talking about. This author is wonderful at creating that movie in your brain. His descriptions of characters and the battles are a real treat for a visual person like me. Another thing I really enjoyed was the way a lesson was woven into the story without coming across as preachy. In school we are always teaching our middle schoolers that the decisions they make today will affect their lives and the person they become for a long time. This book carries that same message. Owen has to make some tough decisions that carry some very have effects for the future. I used to say I didn't like reading fantasy. However, if you were to check my shelves at school, the fantasy section makes up at least a quarter of all of my books. That would be somewhere around 300 to 350 fantasy books. What I discovered was that I don't care for adult fantasy books. I love middle grade and young adult fantasy. This one is a great addition to my school shelves, and one that I recommend to all fantasy lovers.